Ernesto Rodrigues/violin, viola. Guilherme Rodrigues/cello, pocket trumpet. Gabriel Paiuk/piano. José Oliveira/percussion. 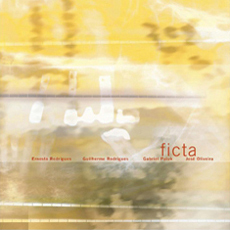 After an aseptic and extremely quiet opening, the quartet on «Ficta» expands its horizons into the ethereal world of sound creation. The two Rodrigues string players and the drummer Oliveira are Portuguese musicians, while pianist Paiuk is Argentinean; thus, they bring forth new music concepts from diverse cultures. Their set consists of six experiments in music having an atonal base and fully unstructured composition. The session proceeds tentatively with each artist testing the atmosphere with stark interjections or quiet musings. This in turn invokes periods of spontaneous blurts of temporal duration, which dissolve back to the eerie world of velvety noise. The fifth member of the group is silence. There are periods of prolonged quietude followed by agitated manipulation of tonal output with bare otic registration. Paiuk is the most outspoken of the group. He intermittently explodes with a short burst on the piano before retreating to the nether region where they all seem to reside and spring forth. “Nihil 00.05” has examples of these outbursts, albeit constricted periods. Ernesto Rodrigues adopts abrupt plucking techniques to make his violin or viola an equal partner in this séance, while Guilherme Rodrigues bows the cello with irregular strokes of sonar-detecting quality.